The Organization of American States failed to advance a plan to deal with Venezuela on Wednesday as it wrapped up a meeting where the country's raging crisis took center stage. Most of the talk around the regional group's general assembly focused on Venezuela, where weeks of protests against President Nicolas Maduro have descended into running street battles with the security forces. Even as the death toll rose to 74 people, the OAS's 34 members were unable to bridge their divisions on addressing the crisis. A US-backed proposal for regional mediators failed to overcome opposition from Maduro's leftist allies in the region and Caribbean countries that have benefited from discounted Venezuelan oil exports. Sparks flew at the three-day meeting in Cancun, Mexico as Venezuelan Foreign Minister Delcy Rodriguez labeled colleagues on the other side of the debate "lapdogs" and told the United States the only way to make Caracas accept regional mediators would be to "send in the Marines." 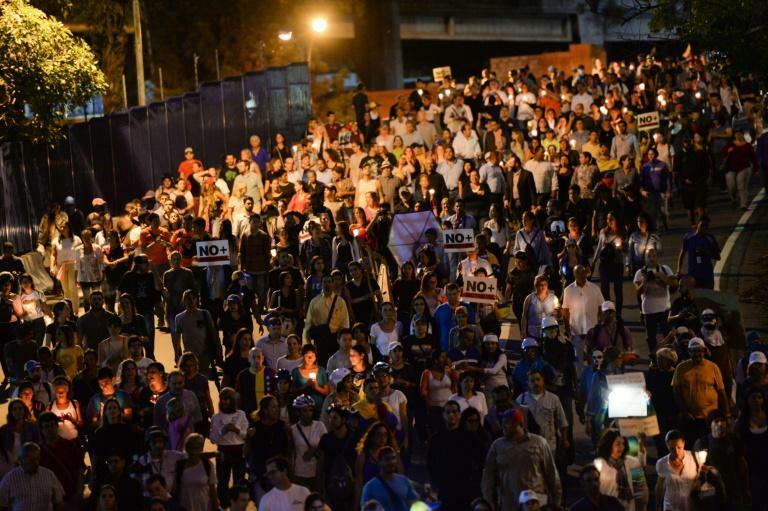 Not to be outdone, Venezuelan opposition lawmakers interrupted the closing ceremony and shouted "Murderers!" as Ecuador -- a close ally of Maduro's government -- took the floor. Foreign ministers meeting on the sidelines of the general assembly tried to forge a compromise resolution in which the OAS would call on Maduro to abandon attempts to rewrite the constitution, guarantee human rights, and hold mediated talks with the opposition. But the proposal fell three votes shy of the 23 it needed. Attempts to get the general assembly to slip the mediation proposal into a broader resolution on human rights also came up short. "While you're here counting votes, we're counting our dead," said exiled Venezuelan opposition leader Carlos Vecchio, one of those who protested at the meeting. It is unclear in any case how much power the OAS can wield over Venezuela, which has launched the two-year-long process of quitting the group. Maduro regularly condemns the OAS as a tool of US "imperialism." Pummeled by the plunge in oil prices since mid-2014, Venezuela is in the grip of an economic and political crisis that is causing desperate shortages of food, medicine and other basic essentials. Maduro, the political heir to late president Hugo Chavez (1999-2013), is fighting off calls for elections to replace him.